Every once in a while you come across a food that is a game-changer—a food that stands out from the rest due to its aromatic and unique pungent flavor. I’m talking about a food that, whenever you see it, you have to have it. The food featured in this article is indeed my favorite food—wild leeks, aka wild ramps. They are also sometimes called wood leeks or wild garlic. Wild leeks are scarce. They are only available in the spring (between April to June), so I always purchase them at the farmers market when I see them available. They resemble the green onion, and have a delicious, strong garlic-onion flavor. Wild leeks also have many similar health benefits to onions and garlic. It is no wonder that wild leeks have quickly become a popular culinary delicacy among chefs, food bloggers, and foragers. In the spring, in addition to farmers markets, they will make a brief appearance at some local farms and in some specialty grocery or health food stores. If you garden, you may want to consider growing wild leeks. 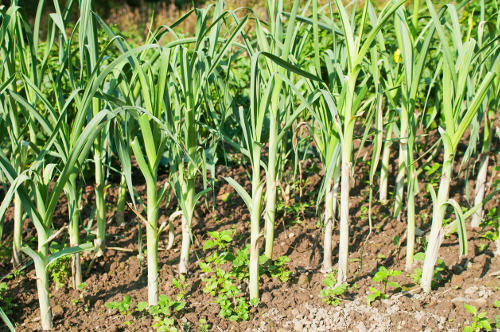 The following article will help explain why and how to grow wild leeks, and also how to cook it. Wild leeks, or ramps, also have the plant name Allium tricoccum, and belong to the onion family. Scottish botanist William Aiton introduced the name in his 1789 catalog of plants cultivated in London’s Kew botanic garden, entitled Hortus Kewensis. Wild leeks are native to North America, and grow wild particularly in eastern Canada and the northern and southeastern United States, especially in the New England states such as Massachusetts, Maine, Connecticut, Rhode Island, Vermont, and New Hampshire. Although wild leeks have grown in popularity over the past 25 years, Cherokee natives have foraged and enjoyed them for centuries. Wild leeks are also linked to Appalachian mountain folklore. Ramps commonly grow in the wild along rocky slopes, forests, and river or stream floodplains. The wild leek is a bulb-forming perennial plant with smooth and broad light green leaves that also have a deep purple or burgundy tints on their lower stems. There is also a scallion-like stalk and bulb. Both the green leaves and white lower stalks are edible. Wild leeks are among the most over-harvested wild foods, which have led to some declines in certain areas. Alternatively, you can plant your own, just like farmers, as ramp seeds can be purchased online or at specialty seed stores. How do you grow wild leeks in your yard? Patience is key when growing wild leeks from seeds, as it can take six to 18 months for the plant to grow. That being said, it is far better to transplant wild leek bulbs in the early spring or late fall. Some plant nurseries and grocery stores sell small planting ramp pots with the bulb and some roots intact. When transplanting, be careful not to damage the bulbs or roots. Ramps grow in close groups that are strongly rooted just beneath the soil’s surface. You will want to plant the bulbs about three inches deep and about four to six inches apart. The tip of the bulb should be planted at the soil surface, and covered with deciduous leaf or leaf mold mulch. Remember to water well. In the early spring, the plant needs full light, but not direct sun. Since wild leeks are woodland plants, they require protection from heat and extreme sun. If you are unable to plant them at the edge of a moist woodland area, at least find a spot in partial shade, or where they can be sheltered from some trees. Although wild leeks like regular moisture, they don’t grow well in wet soil. Harvest time is late April and lasts until June when the ramp leaves will begin to die off. After harvest, dormant ramp bulbs will live peacefully in moist and full-shaded areas. Wild leeks are loaded with nutrition. For instance, they contain many of the same sulfur compounds as garlic, including allicin and kaemperol. Other sulfur compounds present in ramp extracts include cepaenes called alpha-sulfinyldisulfides and allyl-containing cepaenes known as 2-propenyl 1-(2-propenylsulfinyl) propyl disulfide. Wild leeks also contain a large amount of antioxidant content, especially polyphenols, vitamin A, vitamin C, and selenium. They are sources of protein, fiber, and carbohydrates, as well as other nutrients like iron, chromium, calcium, folate, and choline. Unfortunately, there is not a lot of comprehensive data readily available on all the nutrients in wild leeks, likely because it is not a common vegetable. That being said, there are some figures out there. The following is a nutrition chart with information for a cup of raw wild leek, or 89 g of the vegetable. What are the health benefits of wild leeks? Well, the iron found in wild leeks helps enhance oxygen distribution in the body, increases energy levels, and supports healthy immune function. Iron is especially important for premenopausal women, who experience iron loss during their menstrual cycles. One of the most noted health benefits of wild leeks is this vegetable’s potential to fight or prevent cancer due to its high antioxidant content. For example, studies suggest that the flavonoid antioxidant kaempferol found in wild leeks is involved in apoptosis (cell death) in various cancer types. A study published in the Journal of Agriculture and Food Chemistry in 2000 suggested that selenium-rich ramps have potential for cancer reduction in humans. As Native Americans have believed for centuries, ramps could benefit the heart and circulatory system. The folate in wild leeks helps regulate the homocysteine levels of the body. In high amounts, the protein homocysteine can contribute to heart diseases, especially atherosclerosis. Research also shows that the kaempferol in wild leeks may reduce the risk of cardiovascular diseases. Wild leeks also contain choline—a precursor to the chemical messenger in the brain, aka neurotransmitter, acetylcholine. Adequate choline in the diet has been found to facilitate learning and support proper cognitive function in children and adults. A study published in The American Journal of Clinical Nutrition in 2011 found that high choline intake is linked to better cognitive performance. Some ramp enthusiasts will forage for wild leeks; however, as mentioned, you can also get some at local farms or specialty stores in the spring. Wild leeks can be eaten raw or cooked, and they can also be dried or frozen. You can substitute them for onion or garlic whenever you want, or add them to springtime soups, stews, salads, pastas, seafood, or egg dishes, and even delicately pickled. Ramps also pair well with onions or garlic, so go ahead use them all in the same dish. The following are a couple wild leeks recipes to get you started with this pungent and delicious vegetable. In a medium saucepan, roast the spices on medium heat until fragrant, and add water and apple cider vinegar and bring to a boil. Place the wild leeks into a clean glass Mason jar or container, and pour pickling liquid over them. Cover with a lid, and allow it to cool at room temperature. Refrigerate for a week, and use it with just about everything, including salads, or as a side. When foraging wild leeks, it is important to be aware that ramps have various look-alikes. A true wild leek will have a lily-green leaf that extends to a purplish-tinge base. Other plants like lily-of-the-valley (Convallaria majalis) have similar leaves; however, it is a poisonous plant. The skunk cabbage (Symplocarpus foetidus) has leaves that are more veined than onion family leaves; and instead of a bulb, it has a fibrous root. Skunk cabbage is not a deadly plant, but it will not make you feel well. False hellebore (Veratrum viride) also has deadly leaves that are heavily veined in closely spaced lines from the petrol to tip. There is also an edible and similar species called Allium ursinum, which is native to Asia and Europe. Wild leeks are very delicious, especially in salads, soups, and pesto. Ramps may also benefit the brain, heart, and immune system. To avoid look-alikes while foraging, purchase ramps at farmers markets, directly from farms, or specialty health food stores. “Ramps,” Specialty Produce; http://www.specialtyproduce.com/produce/Ramps_775.php, last accessed May 5, 2017. “Foods Indigenous to the Western Hemisphere,” American Indian Health and Diet Project; http://www.aihd.ku.edu/foods/Ramps.html, last accessed May 5, 2017. Baum, J., “Nutritional Benefits of Ramps,” LIVESTRONG; http://www.livestrong.com/article/257269-nutritional-benefits-of-ramps/, last updated Nov. 13, 2015. Combs, D., “Wild Ramps Need Your Help!” Hobby Farms, April 13, 2016; http://www.hobbyfarms.com/wild-ramps-need-your-help/. Daniluk, J., “Ramp up the heart health with wild leeks,” Chatelaine; http://www.chatelaine.com/health/diet/ramp-up-your-heart-health-with-wild-leeks/, last updated Nov. 1, 2012. “Allium tricoccum,” Plants For A Future; http://www.pfaf.org/user/Plant.aspx?LatinName=Allium+tricoccum, last accessed May 5, 2017. Iannotti, M., “Growing Ramps in the Vegetable Garden,” the Spruce; https://www.thespruce.com/growing-ramps-in-the-vegetable-garden-1403463, last update January 17, 2017. “Growing Ramps,” Rodale’s Organic Life, Feb. 23, 2012; http://www.rodalesorganiclife.com/garden/growing-ramps, last accessed May 5, 2017. “Ramps/Wild Leeks,” Wild Foods Home Garden; http://wildfoodshomegarden.com/Ramps.html, last accessed May 5, 2017. “Wild Leek,” Ontario Wild Flower; http://ontariowildflowers.com/main/species.php?id=119, last accessed May 5, 2017. “Allium tricoccum,” Go Botany; https://gobotany.newenglandwild.org/species/allium/tricoccum/, last accessed May 5, 2017. Peterson, L., “Everything You’ve Always Wanted to Know About Ramps,” Eater, April 10, 2015; https://www.eater.com/2015/4/10/8384255/everything-youve-always-wanted-to-know-about-ramps. Thomson, J.R., “What Are Ramps, Anyway? And Why Do Food Lovers Freak Out Over Them?” HuffingtonPost; http://www.huffingtonpost.com/2015/04/24/what-are-ramps_n_7128438.html, last updated April 24, 2015. “Ramps,” Organic Authority, April 26, 2011; http://www.organicauthority.com/vegetables/ramps.html. “Ramps,” eat this much; https://www.eatthismuch.com/food/view/ramps,139795/, last accessed May 5, 2017. Mateljan, G., The World’s Healthiest Foods: Essential Guide for the healthiest way of eating (Seattle: George Mateljan Foundation, 2007), 762-763. Kim, S-H., et al., “Anti-cancer Effect and Underlying Mechanism(s) of Kaempferol, a Pytoestrogen, on the Regulation of Apoptosis in Diverse Cancer Cell Models,” Toxicological Research, Dec. 31, 2013; 29(4): 229-234, doi: 10.5487/TR.2013.29.4.229. Whanger, P.D., et al., “Tumorigenesis, metabolism, speciation, bioavailability, and tissue deposition of selenium in selenium-enriched ramps (Allium tricoccum),” Journal of Agriculture and Food Chemistry, November 2000; 48(11): 5723-5730. https://www.ncbi.nlm.nih.gov/pubmed/11087545Poly, C., et al., “The relation of dietary choline to cognitive performance and white-matter hyperintensity in the Framingham Offspring Cohort,” The American Journal of Clinical Nutrition, December 2011; 94(6): 1584-1591, doi: 10.3945/ajcn.110.008938. Calvey, E.M., et al., “Allium chemistry: identification of organosulfur compounds in ramp (Allium tricoccum) homogenates,” Phytochemistry, September 1998; 49(2): 359-364. https://www.ncbi.nlm.nih.gov/pubmed/9747536.